By clicking the links below, you can view and print our forms in PDF format. Once they’ve been printed, you will need to fill them out and bring them with you to your first dental appointment with us. 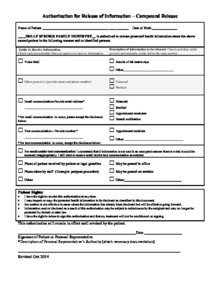 All patients will need to download and fill out a Health History form and Patient Registration form. Please bring these completed forms with you to your scheduled appointment. Set yours up by calling us today for dental care in Holly Springs, NC. You are more than welcome to print out the Authorization for Release form. You are more than welcome to print and fill out both of these forms before coming in for your scheduled appointment. 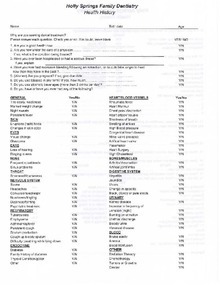 This form is for adult patients, 14 years of age and older. To make things easier for you, we welcome you to click on each PDF file to download, print, fill out and take with you to your next appointment. You are more than welcome to print and fill out both of these forms before coming in for your scheduled appointment. 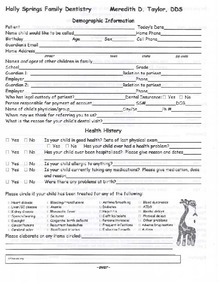 This form is for children, ages infant through 13 years of age. 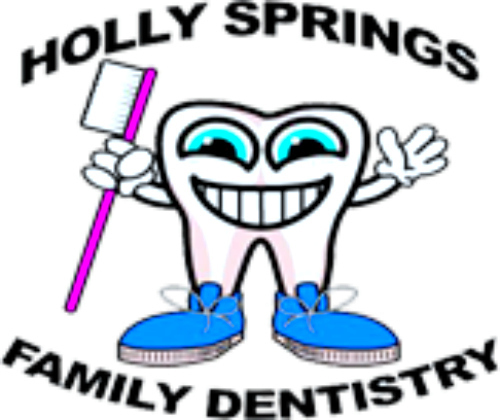 If you are a new patient to Holly Springs Family Dentistry, then welcome to our practice! 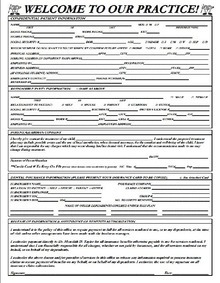 You are more than welcome to print and fill out this form before coming in for your scheduled appointment. Thank you for choosing us as your dental care provider! To make things easier for you, we welcome you to click on the PDF file to download, print, fill out and take with you to your next appointment. 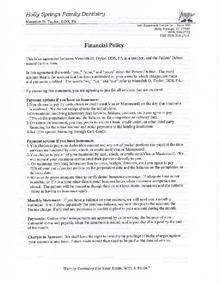 All patients are more than welcome to print out and sign our Financial Policy before coming in for your scheduled appointment. The policy is shown here for your convenience. Posting the revised Notice on our website: www.hollyspringfamilydentistry.com.